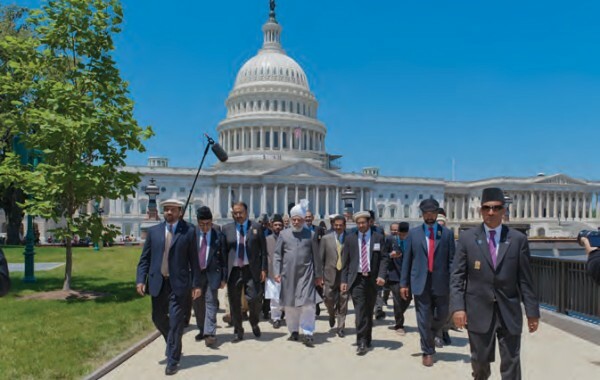 Keynote Address delivered by Hazrat Mirza Masroor Ahmadaa, Khalifatul Masih V, Head of the worldwide Ahmadiyya Muslim Community on 27th June 2012 at Capitol Hill in Washington, D.C.
Bismillahir-Rahmanir-Rahim—In the name of Allah, the Gracious, Ever Merciful. All distinguished guests—assalamo ‘alaikum wa rahmatullahe wa barakatohu—peace and blessings of Allah be upon you all. Before proceeding, I would like to first of all take this opportunity to thank you all for taking the time to come and listen to what I have to say. I have been requested to speak about a subject that is extremely vast and wide ranging. It has many different aspects and therefore, it is not possible for me to cover all of them in the short time available. The subject that I have been asked to speak about is the establishment of world peace. Certainly, this is the most vital and pressing issue facing the world today. However, as the time is limited, I will only briefly give the Islamic viewpoint on the establishment of peace through just and equal relations between nations. The truth is that peace and justice are inseparable—you cannot have one without the other. Certainly, this principle is something that all wise and intelligent people understand. Leaving aside those people who are determined to create disorder in the world, no one can ever claim that in any society, country or even the entire world, that there can be disorder or a lack of peace where justice and fair dealing exist. Nevertheless, we find in many parts of the world that disorder and a lack of peace are prevalent. Such disorder is visible both internally within countries, and externally in terms of the relations between various nations. Such disorder and strife exists even though all governments claim to make policies that are based on justice. All claim that the establishment of peace is their primary objective. Yet, in general, there is little doubt that restlessness and anxiety is increasing in the world, and so disorder is spreading. This clearly proves that somewhere along the line, the requirements of justice are not being fulfilled. Therefore, there is an urgent need to try and end inequality, wherever and whenever it exists. 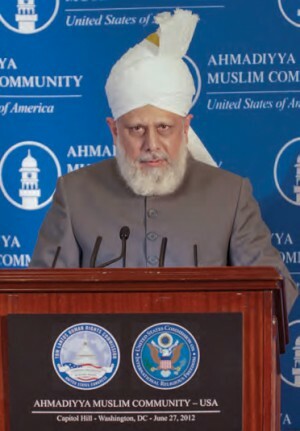 Thus, as the worldwide Head of the Ahmadiyya Muslim Community, I would like to make a few observations about the need for, and the ways to achieve peace based on justice. 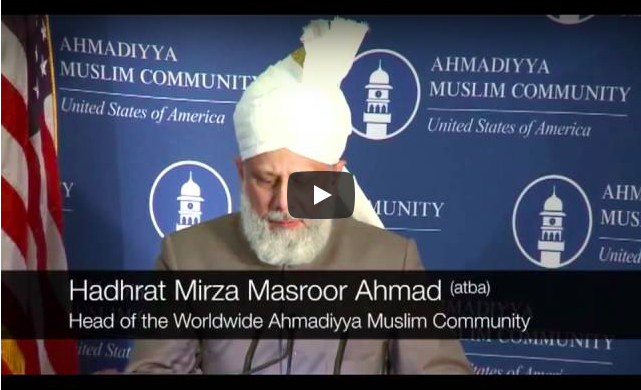 The Ahmadiyya Muslim Community is purely a religious community. It is our firm belief that the Messiah and Reformer who was destined to appear in this age and enlighten the world as to Islam’s true teachings has indeed arrived. We believe that the Founder of our Community, Hadrat Mirza Ghulam Ahmad as of Qadian, was that very Promised Messiah and Reformer, and thus we have accepted him. He pressed upon his followers to act and propagate the real and true teachings of Islam that are based on the Holy Qur’an. Therefore, everything that I will say in relation to establishing peace, and in relation to conducting just international relations, will be based on Qur’anic teachings. It is important to always remember that human knowledge and intellect is not perfect, but is in fact limited. Thus, when making decisions or forming thoughts often certain factors enter human minds, which can cloud judgement and lead to a person trying to fulfil his own rights. Ultimately, this can lead to an unjust outcome and decision being made. God’s Law, however, is perfect and so no vested interests or unfair provisions exist. This is because God only desires for the good and betterment of His Creation and therefore, His Law is based entirely on justice. The day the people of the world come to recognise and understand this crucial point will be the day that the foundation for true and everlasting peace will be laid. Otherwise, we continue to find that although efforts are endlessly made to establish world peace, yet they are unable to provide any worthwhile results. After the conclusion of the First World War, the leaders of certain countries desired for good and peaceful relations between all nations in future. Thus, in an effort to achieve world peace the League of Nations was formed. Its principal aim was to maintain world peace and to prevent future wars from breaking out. Unfortunately, the rules of the League and the resolutions it passed had certain flaws and weaknesses and so they did not properly protect the rights of all peoples and all nations equally. Consequently, as a result of the inequalities that existed, long term peace could not prevail. The efforts of the League failed and this led directly to World War II. We are all aware of the unparalleled destruction and devastation that ensued, where around 75 million people globally lost their lives, many of who were innocent civilians. That war should have been more than enough to open the eyes of the world. It should have been a means to developing wise policies that granted all parties their due rights, based on justice, and thus prove to be a means of establishing peace in the world. The world’s governments at the time did endeavour to some extent to try and establish peace, and hence the United Nations was established. However, it soon became quite apparent that the noble and overarching objective underpinning the United Nations could not be fulfilled. Indeed, today certain governments quite openly make statements that prove its failure. However, today we find that there is division and separation between powerful and weaker nations. For example, in the United Nations we find that there is a distinction made between certain countries. Thus, in the Security Council there are some permanent members and some non-permanent members. This division has proved to be an internal source of anxiety and frustration and thus we regularly hear reports of certain countries protesting against this inequality. Islam teaches absolute justice and equality in all matters and so we find another very crucial guideline in Chapter 5, verse 3 of the Holy Qur’an. In this verse it states that to fully comply with the requirements of justice, it is necessary to treat even those people, who go beyond all limits in their hatred and enmity, with fairness and equity. The Qur’an teaches that wherever and whoever counsels you towards goodness and virtue, you should accept it, and wherever and whoever counsels you towards sinful or unjust behaviour, you should reject it. A question that naturally arises is that what is the standard of justice required by Islam? In Chapter 4, verse 136, the Holy Qur’an states that even if you have to testify against yourself, or your parents or your most loved ones, then you must do so in order to uphold justice and to uphold the truth. Powerful and rich countries should not usurp the rights of the poor and weaker countries in an effort to preserve their own rights, and nor should they deal with the poorer nations in an unjust fashion. On the other hand, the poor and weaker nations should not seek to inflict harm on the powerful or wealthy nations whenever the opportunity arises. Instead, both sides should endeavour to fully abide by the principles of justice. Indeed, this is a matter of crucial importance in maintaining peaceful relations between countries. Another requirement for peace between nations based on justice is given in Chapter 15, verse 89 of the Holy Qur’an where it states that no party should ever look enviously at the resources and wealth of others. Similarly, no country should seek to unjustly appropriate or take over the resources of another country on the false pretext of trying to assist or support them. Thus, on the basis of providing technical expertise, governments should not take advantage of other nations by making unjust trade deals or contracts. Similarly, on the basis of providing expertise or assistance, governments should not try to take control of the natural resources or assets of the developing nations. Where less educated people or governments need to be taught how to properly utilise their natural resources, then this should be done. Then, nations and governments should always seek to serve and help those less fortunate. However, such service should not be rendered with an aim of achieving national or political benefits or as a means to fulfil vested interests. We find that in the past six or seven decades the United Nations has launched many programmes or foundations aiming to help the poor countries to progress. Towards this effort they have explored the natural resources of the developing nations. However, despite these efforts, none of the poorer countries have reached the stage or level of the developed nations. One reason for this is certainly wide-ranging corruption by many of the governments of those under-developed countries. With regret though I must say that despite this, as a means to further their own interests, the developed nations have continued to deal with such governments. Trade deals, international aid and business contracts have continued to be processed. As a result, the frustrations and restlessness of the poor and deprived segments of society have continued to increase and this has led to rebellion and internal disorder within those countries. The poor people of the developing countries have become so frustrated that they have turned against not only their own leaders, but also the big powers as well. This has played into the hands of the extremist groups, who have taken advantage of the frustrations, and so have been able to encourage such people towards joining their groups and supporting their hate-filled ideology. The ultimate result of this has been that the peace of the world has been destroyed. The circumstances for taking action, based on Islamic teachings are detailed in the Qur’an, in Chapter 49. (Ch.49 : V.10) It teaches that when two nations are in dispute and this leads to war, then other governments should strongly counsel them towards dialogue and diplomacy so that they can come to an agreement and reconciliation on the basis of a negotiated settlement. If, however, one of the parties does not accept the terms of agreement and wages war, then other countries should unite together and fight to stop that aggressor. When the aggressive nation is defeated and agrees to mutual negotiation, then all parties should work towards an agreement that leads to long-standing peace and reconciliation. Harsh and unjust conditions should not be enforced that leads to the hands of any nation being tied, because in the long-term that will lead to restlessness, which will ferment and spread. The result of such restlessness will be further disorder. Thus, for the requirements of justice to be fulfilled, it is essential that the countries that are negotiating a settlement should themselves not seek to fulfil their own personal interests, nor try to derive benefit unduly from either country. They should not interfere unjustly or pressure either of the parties unfairly. The natural resources of any country should not be taken advantage of. Unnecessary and unfair restrictions should not be placed upon such countries, because this is neither just and nor can it ever prove to be a source of improving relations between countries. Thank you very much. Thank you again. According our tradition, at the end of the function we normally perform a silent prayer. Thus, I will perform the silent prayer and the Ahmadis will follow me. All of you, our guests, can pray in your own way.